More bad news is in store for the Knicks. 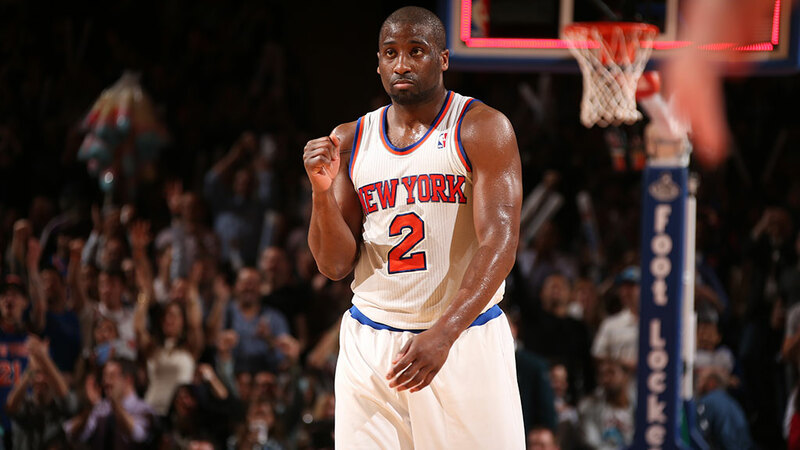 Following Raymond Felton’s arrest early Tuesday on gun charges, he remains in police custody after his wife alleged that he threatened her with a Belgian-made pistol. Ariane Raymondo-Felton made a statement to detectives at a Manhattan police precinct Monday night. Felton arrived at the precinct after Monday night’s game with a lawyer, after investigators reached out to Madison Square Garden security to get in contact with the basketball player. Felton is expected to be arraigned later today in Manhattan criminal court. Today, the Guardian posted a great video of two inmates at a prison in Mexico City who are part of the penitentiary’s wrestling program. Over at SB Nation, Weslye Saunders writes about his experience at the 2011 NFL combine. Even though things didn’t go quite according to plan, it all worked out A-OK in the end. There are seven NBA games scheduled for today, which is great news for you, dear basketball fan. For a sans-Nene Wizards matchup against a sans–Arron Afflalo Magic, head over to CSNB at 7 p.m. For some Kyrie Irving pre-max-contract play, head over to Fox Sports Ohio at 7 p.m. (They play the Raptors.) If you’re more into a non–Paul Millsap and a non–Jimmy Butler matchup, check out WGNS at 7:30. If you want more entertaining games against some of the better teams in the league, the Trail Blazers and Nuggets play at 9 p.m., though Portland will be without LaMarcus Aldridge, Joel Freeland, and Meyers Leonard. Ty Lawson will likely still be out for the Nuggets. Alternately, you can catch T-Wolves-Suns at the same time. Be on the lookout for another strong Kevin Love showing and Minnesota’s desire to avenge a 104-103 loss to Phoenix on Jan. 8. Here’s the full listing. On the college end, seven ranked teams play — from five different conferences. Start off your night watching the newly crowned no. 1 Florida Gators against Vanderbilt at 7 p.m., and then flip to some Big Ten play between no. 14 Wisconsin and Indiana before finishing your night with some West Coast hoops — San Jose State vs. no. 13 San Diego State. The night also offers other matchups in the Big Ten and Mountain West, as well as the ACC and whatever conference Wichita State is in, so you’re sure to find something you like. Here’s the complete schedule. Guess what? Hockey is back! The Hurricanes visit the Sabres in the first post-Olympics NHL game. Buffalo’s star goalie Ryan Miller is scheduled to start tonight despite missing practice earlier because he was traveling from Sochi. The Sabres hope this break was the one they needed, as they remain in last place at 15-34-8. The two teams were set to play January 7, but a blizzard postponed the match.